Pictured, from left, are Lana Grover, Joe Helterbrand and Loraleigh Mayhan in front of the Library of Congress sign. Thousands of FFA members from throughout the country are converging on Washington, D.C., this summer to evaluate their personal skills and interests, develop leadership talent, and create service plans that will make a difference in their communities. 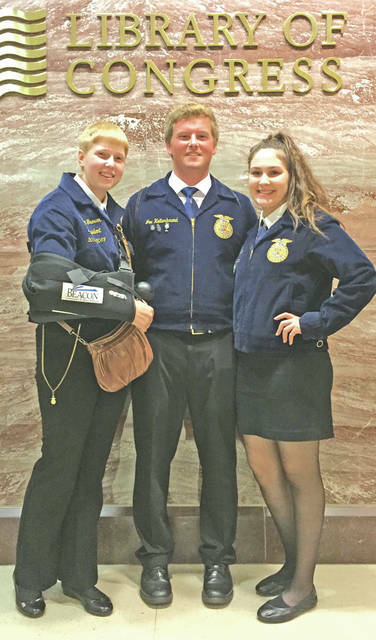 Lana Grover, Loraleigh Mayhan and Joe Helterbrand from the Hillsboro FFA Chapter attended the conference from June 5-9. “WLC was a good experience for making great friends while learning how to help our community and respect diversity in our nation’s capital,” Mayhan said. Over the next seven weeks more than 2,300 students are registered for the 2018 Washington Leadership Conference, the second-largest student experience that the National FFA Organization hosts each year. Created in 1969 and held annually, the conference began June 5 at the Omni Shoreham Hotel. FFA members can attend the conference during one of seven weeks through July 28. They spend the week under the guidance of professionals, counselors, and FFA staff. In workshops, seminars and small groups, members focus on identifying and developing their personal strengths and goals while undergoing comprehensive leadership training that help them guide their local FFA chapters. The capstone of the event is a civic engagement activity where participants apply what they have learned to a hands-on activity. Members also analyze the needs of their communities, develop wide-ranging and high-impact community service initiatives, and implement their plans with the help of their FFA chapters upon return home. Students in recent years have promoted agricultural literacy, brought attention to abuse, collected and distributed shoes to individuals in Haiti, created a hunger awareness plan and more. FFA members experience the history of the nation’s capital and tour landmarks including the Washington Monument, the National Mall, Arlington National Cemetery and the U.S. Capitol, among others. Members also have an opportunity to participate in congressional visits during the week. The 2018 Washington Leadership Conference is sponsored by title sponsors CSX, Monsanto, Farm Credit and weekly sponsor Valent. Submitted by Joe Helterbrand, Hillsboro FFA Chapter. https://www.timesgazette.com/wp-content/uploads/sites/33/2018/06/web1_Leadership-pic.jpgPictured, from left, are Lana Grover, Joe Helterbrand and Loraleigh Mayhan in front of the Library of Congress sign.